NEO For Iwata Series airbrushes are designed to deliver soft, effortless coverage at low air pressures, making them an easy choice for many types of spray applications. NEO For Iwata TRN2 Side Feed Dual Action Trigger Airbrush comes with interchangeable 0.20 oz / 6 ml cup with lid, 0.50 oz / 15 ml cup and a 1oz / 30 ml bottle. 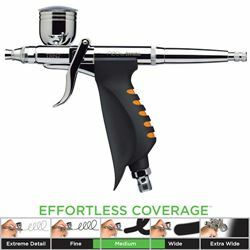 Fine atomization is achieved with the smallest air compressors, making NEO an affordable option for general purpose spraying and for anyone wanting to airbrush for the first time. Additional cup and bottle options available, sold sepatately.